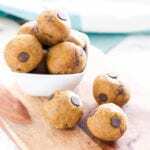 The cookie dough-like texture of these Vanilla Maple Chocolate Chip Protein Bites make them a healthy snack you’ll love to eat. They’re also paleo, vegan, gluten-free and grain-free! Meanwhile, stir together the almond flour, protein powder and sea salt in a large bowl. Discard all but about 2 tbsp water from the dates. Pour the dates and reserved soaking water and in the food processor. Whirl until they’re as broken down as you can get them. Add the almond butter, maple syrup, vanilla, cinnamon and maple extract (if using). Continue processing until smooth, scraping down the edges of the processor bowl as needed. Once even in consistency, pour the dough back into the big bowl. Knead in the chocolate chips. Roll into 12 balls and store in the fridge, or sealed in the freezer.